This post was originally published on the LHIP blog site. The entire process of creating an interpretive, educational website about Hispanic heritage on and along Route 66 in New Mexico has definitely been an interesting one. I have worked on interpretive projects before, and creating a StoryMap about this topic was both more demanding and more relaxed than anticipated. A lot of the work I do with digital media is for younger audiences, those that are considered computer literate. I carry my own assumptions of what is considered “easy” and “intuitive” for technology mostly because I grew up using computers and different forms of tech both for recreational and educational purposes. However, I had to constantly remind myself and edit content for this particular project to be more intuitive and suitable for an older audience. While this information will only be exclusively available online, most of the people who utilize the National Trials’s resources are older adults that tend to be less familiar with current technology. This was an interesting challenge to work through because the text and site I was creating had to have language that explained material to their expectations (which was a bit more in depth than normal), while also trying to make the experience as smooth as possible when interactive with different forms of digital media. So, while I had to go over details about Route 66’s alignment and be precise about dates and how the bypass specifically affected different communities, I also had to be contingent of how the text appeared, using tools like pointing out when users can click on a link and coloring it in a brighter color so that, through repetition, they will also know that future text that is that color can also be clicked on. I created this GIF to illustrate that the history of Route 66 goes far beyond rockabilly and road trips and impacts the lives of numerous individuals who live, work, and play on and along the road. I had to make sure site users knew they could access this content by clicking on a particular link by noting where they click in the text and highlighting it a different color so it stands out. I am pretty happy with the end product. There was definitely more information I could have included, but, given the platform, I didn’t want to overburden users too much. I do think, however, that there are many opportunities for future interns and staff to expand this project to create new StoryMaps based on specific communities, zooming in on a miro-scale, or to focus on other geographic regions entirely, such as Texas or Arizona, whose Hispanic residents have entirely different experiences than those in New Mexico. I hope projects like this continue. I hope those that use this site enjoy the experience and learn from it and that it can serve as a great example why having a presence online or how using technology can be a great form of outreach to visitors. It can be accessible, even if those using the platform aren’t entirely tech-savvy, and can create unique experiences that provide educational content in a new way. Originally published on the LHIP blog site. As part of the interpretive StoryMaps website about Hispanic heritage on Route 66 that I am creating, I have had to locate and include as many images as possible, which are interspersed throughout the text. These images are all important. They attract users and offer a break from reading text, provide greater context, and, perhaps most importantly, can feature the people behind these stories and show that the history of Hispanics on and along the Mother Road was a lived experience. This image, from the Center for Southwest Research archives, is a great example of advertising Hispanic stereotypes to attract visitors. In this image, Coronado and conquistadors are romanticized and are meant to represent the Hispanic population in New Mexico. To use this image in the StoryMap, I had to locate it in the archives first before I could ask permission. One collection of images I have been utilizing comes from previous research with the Route 66 Corridor Preservation Program in conjunction with the University of New Mexico Spanish Colonial Research Center. 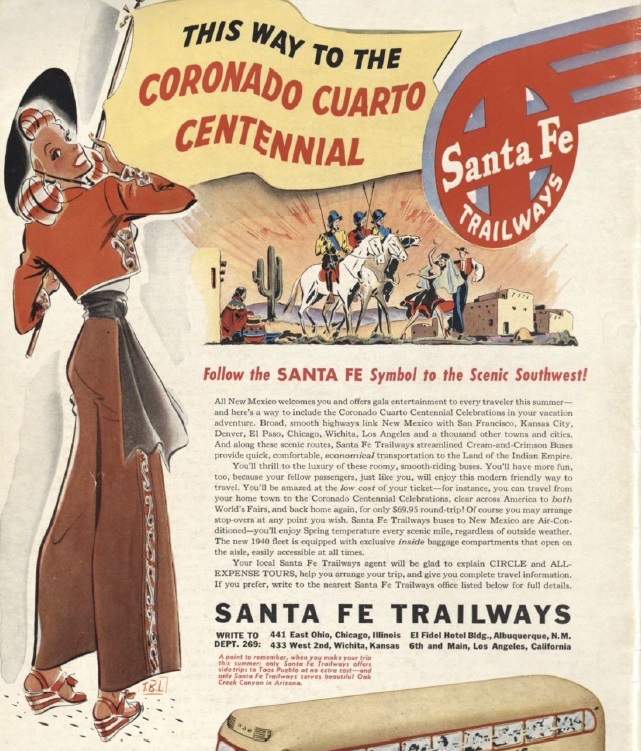 These images are largely a collection of postcards, magazines, and marketing material, and provide a great example for how Hispanic and Native American culture as commodified and stereotyped to attract visitors to drive through New Mexico. The one caveat of using these collections is that when they were collected, they were not properly cited. I have to ask permission to use all images utilized on the website, and this requires an exact location and description of each item. The process of finding these images has been pretty tedious, but not fruitless. Luckily, the archives are next door to the office I am at, and the staff and archivists are wonderful and extremely helpful. I’ve actually managed to locate most of the images and obtain permission, which is great. There is some excitement in actually finding something you’re looking for, a sense of accomplishment for being able to fill out all of the information needed and know exactly where it is among a plethora of collections. 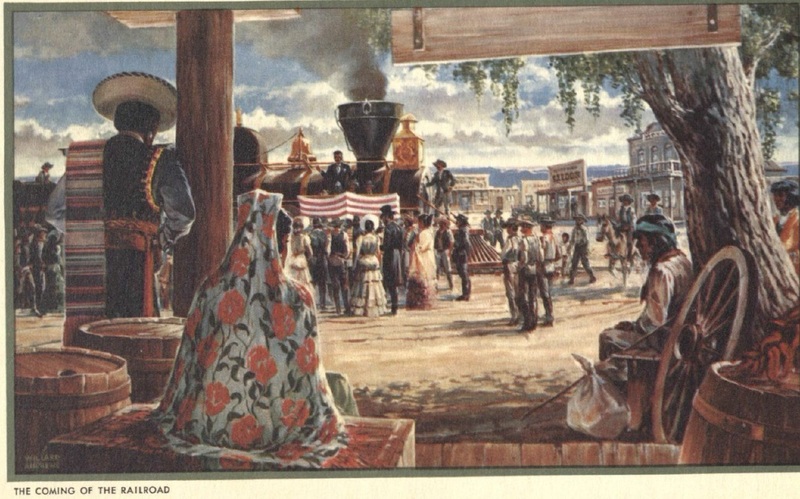 This postcard is used on a section about the railroad in New Mexico and how Route 66 followed some of its tracks. This image is also from the Center for Southwest Research, and had to be located within its New Mexico Pamphlet Collections. For the images I can’t locate, I have gotten very good at going back through other collections and images that I know I have permission to use or have the exact location for. There are a surprising number of collections that are open to allowing the use of their images and resources for educational purposes, even if it is *technically* counted as being published as a website. This entire process of emailing different archives and people and asking them permission to use their collections has been an extremely positive experience, and one that will surely come in handy as I move on to other projects and continue to work with digital media and interpretation.